An extraordinary space where contemporary life and contemporary art connect, challenge and inspire one another. IMMA is fully wheelchair accessible. Manual wheelchairs are also available on a first-come first served basis. The Museum buildings, cafe and shop are all served by lifts and are fully accessible. IMMA is quite a large site so there are travel distances between buildings to be aware of when planning your visit. Parking is available for blue badge holders close to the Main entrance of the Museum and Cafe. 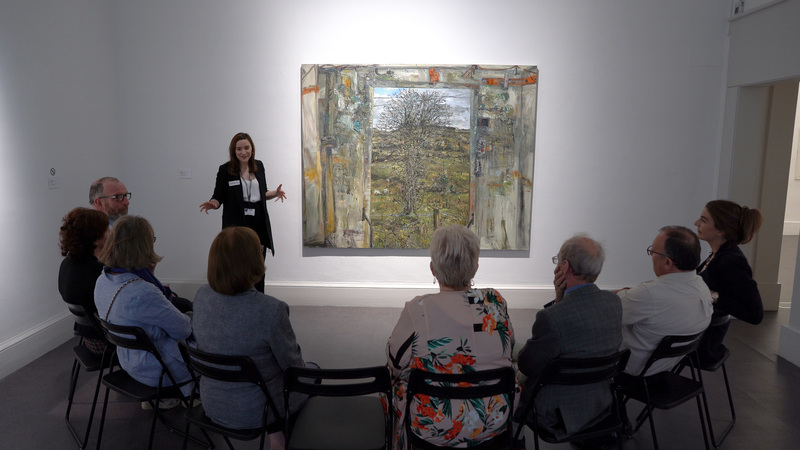 On the first Friday of every month we offer free guided tours specially designed to support people living with dementia and their family, friends or professional carers. The tours are designed to engage with our current exhibitions and to create an enjoyable social and cultural experience. All tours are free of charge and are followed by an optional, complimentary cup of tea or coffee together in IMMA’s on-site café. For further detailed information on this programme and for dates of upcoming tours please visit the dedicated Azure page on our website, or search the What’s On section for upcoming tour dates. Azure is free of charge but booking is essential as places are limited. Please contact Bairbre-Ann for more information or to reserve places, edcommbooking@imma.ie or tel +353 (0)1 612 9955.